Recently, we have shown that a CMR method can non-invasively determine the oxygen extraction fraction (OEF) in dogs during hyperemia [1, 2] with assumed myocardial blood volume (MBV) values. The purpose of this study is to determine the effect of quantified MBV to the calculation of myocardial OEF during pharmacologically induced hyperemia in coronary artery stenotic dogs. Thirteen dogs were divided into four groups (Table 1). Stenosis was created by using an occluder in the proximal left anterior descending coronary artery (LAD) in an open-chest model. Single-slice T2-weighted images were gathered by use of a 2-D segmented turbo spin-echo (TSE) sequence with double inversion recovery pulses. T2 maps can be generated with these T2-weighted images with different TE's acquired in a single breath-hold. This T2-imaging was performed several times during rest and during either Dipyridamole or Dobutamine-induced hyperemia. Using a two-compartment model validated in normal dogs , the OEF during hyperemia can be determined assuming resting OEF of 0.6, which is based on OEF values measured in normal dogs using an arterial and coronary sinus blood sampling approach at rest . It is assumed that this value changes little with moderate stenosis , but for severe stenoses, this may be a potential source of error. The model also requires input of MBV values both at rest and during pharmaceutical hyperemia. These values were determined with a validated first-pass perfusion cardiovascular magnetic resonance (CMR) method . 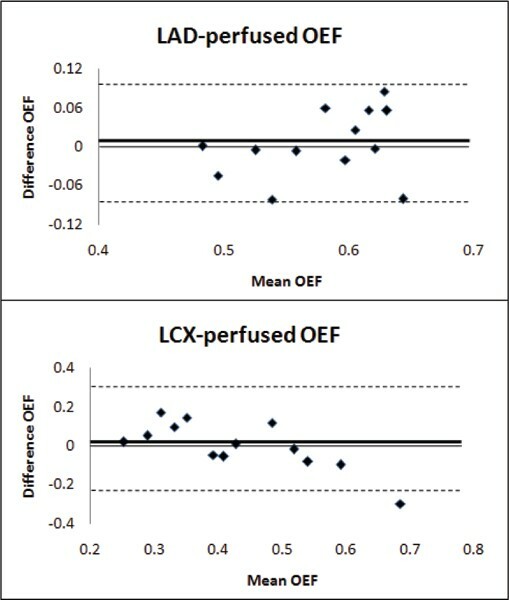 OEF values were determined in the stenotic LAD region and a remote normal left-circumflex (LCX) subtended region. There is no significant change in OEF values calculated using assumed MBV and MBV measured with the quantitative CMR first-pass method. Nevertheless, the former slightly overestimated the later (0.3% in LAD-perfused and 5.8% in LCX-perfused regions) (Figure 1). This difference may explain why the former method slightly overestimated the "true" OEF values measured in normal dogs using the arterial-venous blood sampling approach . The changes in OEF with measured MBV are shown in Figure 2. With the injection of Dipyridamole, while normal LAD region demonstrates reduced OEF of 0.31 (48% reduction), OEF in the LAD region changes to 0.54 (11% decrease) and 0.6 (0% change) in dogs with 70% and 90% stenosis, respectively. 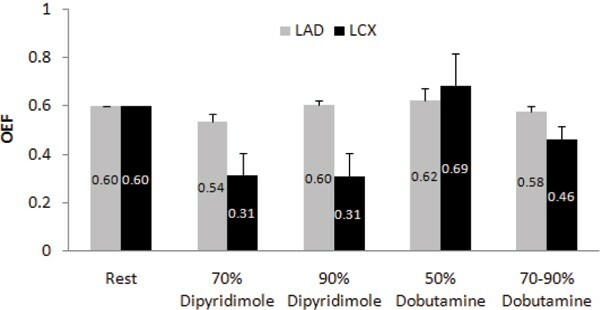 During the Dobutamine-induced hyperemia, dogs with stenosis had slight changes in OEF in the LAD region, but an increase to 0.69 (14% increase) and decrease to 0.46 (23%) in the LCX region with 50% and 70–90% stenosis, respectively (P = NS). This is consistent with our previous observation . Bland-Altman plots of the difference in OEF calculated with assumed MBV and measured MBV. Off changes during hyperemia The impact of myocardial blood volume determination to a CMR method was evaluated in the estimation of myocardial OEF during hyperemia in a canine stenosis model. The effect of blood volume is subtle and regional myocardial OEF can be detected. Using the two-compartment model and CMR methods, the effect of MBV quantification is subtle in the calculation of myocardial OEF. In dogs with varying severities of coronary artery stenosis, regional differences in OEF during the hyperemia can be readily detected using this CMR method.